The US is the 2nd largest e-commerce market worldwide with $640 billion spent a year. 620 million Americans buy goods online. Again, 2nd only to China. Unless you are fluent in Chinese or hire someone who is, the US is a target market that makes sense. However, persuading Americans to buy online from a foreign store is quite the challenge. How Can Texting Create Trust for International Sellers On Shopify? Trust for buyers on Shopify means to have confidence in the sellers and their integrity. The best way to create trust in the real world is through interpersonal relationships. Obviously, online transactions are not built on human interaction. When buying from an unfamiliar source, especially from a different country, customers feel uncertain. Uncertainty leads to doubts and inaction. This is where mobile texting provides a solution. Mobile texts feel more personal to buyers because they are the exact same interface people use with their friends, family, and colleagues, and it’s on the device they love most, their cell phone. Texting will help you overcome the virtual barrier with your customers. 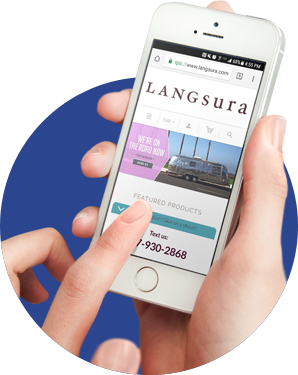 Interacting with your customers through a mobile text conversation with a local number will create a relationship. Customers will feel listened to and respected. All of this will extend the trust required to close a transaction. Ka-ching – relationship cemented, customer converted. Serving a different market? No problem. The same rules apply, adjusted for your target geography. Contact us and we’ll check on number availability in other countries for you. Pricing varies by country and we support texting in over 120 countries.